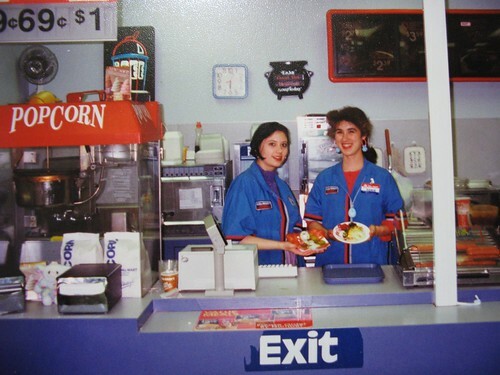 After high school, I worked at Walmart in the dreaded snack bar. Man, what an awful gig. The "grilled chicken" sandwich with "fries" consisted of a frozen prefabricated-chicken-breast-shaped patty, always the same size and shape, with stamped-on grill marks. We would add to the plate some microwaveable "fries" that came frozen in a box. Each fry had its own fry-crisp compartment for a total of exactly 30 fries. People would eat there every day. The truly knowledgeable regulars knew that for .25 cents more, you could get "extra" butter on popcorn. They would stand at the counter happily watching us squirt butter-flavored oil (said so in big letters) all over the already nasty pop corn. My co-workers were named Jane, Janie, and Janet. I could go on and on. One day, I was on my lunch break, sitting in the car as to avoid EVERYONE, and this song came on. Why do I give valuable time to people who don't care if I live or die? You got that right. After my lunch break was over, I walked back inside and said, "Yeah... I quit." I really like this track! Incredibly well done. I just discovered your blog and I feel like weeping for joy. Thank you for your labor of love. Thanks and welcome to my journey through Smithdom! I believe that Morrissey himself would be extremely pleased with that story. Dani, I thought that was you! I've been thinking of you since I've been working on Girl Afraid. Did you get to hear it played on the radio today?? Incredible. Just discovered your project. It adds something new and moving to the songs all over again. Fantastic work!